In the world of Clouds and Vulnerability Management, based on observations, it seems like a critical issue has slipped under the radar: if you’re running with PaaS and SaaS VMs, you cannot deliver anything close to a respectable level of vulnerability management with these platforms. This is because to do effective vulnerability management, the first part of that process – the vulnerability assessment – needs to be performed with administrative access (over SSH/SMB), and with PaaS and SaaS, you do not, as a customer, have such access (this is part of your agreement with the cloud provider). The rest of this article explains this issue in more detail. The main reason for the clouding (sorry) of this issue, is what is still, after 20+ years, a fairly widespread lack of awareness of the ineffectiveness of unauthenticated vulnerability scanning. More and more security managers are becoming aware that credentialed scans are the only way to go. However, with a lack of objective survey data available, I can only draw on my own experiences. See – i’m one of those disgraceful contracting/consultant types, been doing security for almost 20 years, and been intimate with a good number of large organisations, and with each year that passes I can say that more organisations are waking up to the limitations of unauthenticated scanning. But there are also still lots more who don’t clearly see the limitations of unauthenticated scanning. The original Nessus from the late 90s, now with Tenable, is a great product in terms of doing what it was intended to do. But false negatives were never a concern in with the design of Nessus. OpenVAS is still open source and available and it is also a great tool from the point of view of doing what it was intended to do. But if these tools are your sole source of vulnerability data, you are effectively running blind. By the way Tenable do offer a product that covers credentialed scans for enterprises, but i have not had any hands-on experience with this tool. I do have hands on experience with the other market leaders’ products. By in large they all fall some way short but that’s a subject for another day. lets say our tool finds Apache HTTP 14.x, it looks in its database of public disclosed vulnerability with that version of Apache, and spews out everything it finds. The tools generally do little in the way of actually probing with HTTP Methods for example, and they certainly were not designed to try, for example, a buffer overflow exploit attempt. They report lots of ‘noise’ in the way of false positives, but false negatives are the real concern. So really the tools are doing a port scan, and then telling you you’re running old warez. Conficker is still very widespread and is the ultimate player in the ‘Pee’ arena (the ‘Pee’ in APT). An unauthenticated scanner doesn’t have enough visibility ‘under the hood’ to tell you if you are going to be the next Conficker victim, or the next ransomware victim. Some of the Linux vulnerabilities reported in the past few years – e.g. Heartbleed, Ghost, DirtyCOW – very few can be detected with an unauthenticated scanner, and none of these 3 examples can be detected with an unauthenticated scanner. Credentialed scanning really is the only way to go. Credentialed based scanners are configured with root/administrative access to targets and are therefore in a position to ‘see’ everything. So how does this all relate to Cloud? Well, there two of the three cloud types where a lack of access to the operating system command shell becomes a problem – and from this description its fairly clear these are PaaS and SaaS. Cloud makers like AWS and Azure will deal with patches, but concerns in security are much wider and operating systems are big and complex. No patches exist for 0days, and in space, nobody can hear you scream. Many vulnerabilities arise from OS configuration aspects that cannot be removed with a patch – e.g. Conficker was mentioned above: some Conficker versions (yes its managed very professionally) use ‘at’ job scheduling to remain present even after MS08-067 is patched. If for example you use Azure, Microsoft manage your PaaS and SaaS but they don’t know if you want to use ‘at’ or not. Its safer for them to assume that you do want to use it, so they leave it enabled (when you sign up for PaaS or SaaS you are removed from the decision making here). Same applies to many other local services and file system permissions that are very popular with the dark side. ‘Unauthenticated scanning gets me some of the way, its good enough’ – how much of the way does it get you? Less than half way? its more like 5% really. Remember its little more than a port scan, and you shouldn’t need a scanner to tell you you’re running old software. Certainly for critical cloud VMs, this is a problem. With PaaS and SaaS, you are handing over the management of large and complex operating systems to cloud providers, who are perfectly justified, and also in many cases perfectly wise, in leaving open large security holes in your platforms, and as part of your agreement with them, there’s not a thing you can do about it (other than switch to IaaS or on-premise). This article is about the place of ego and pride in information security. 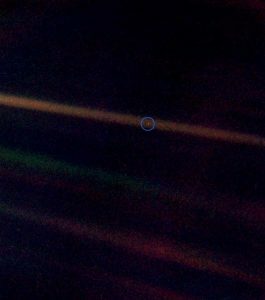 At the request of the late Carl Sagan, as the Voyager 1 space probe was leaving the solar system, at a record distance of approx 6 billion miles from Earth, NASA instructed Voyager 1 to turn its camera back toward Earth. 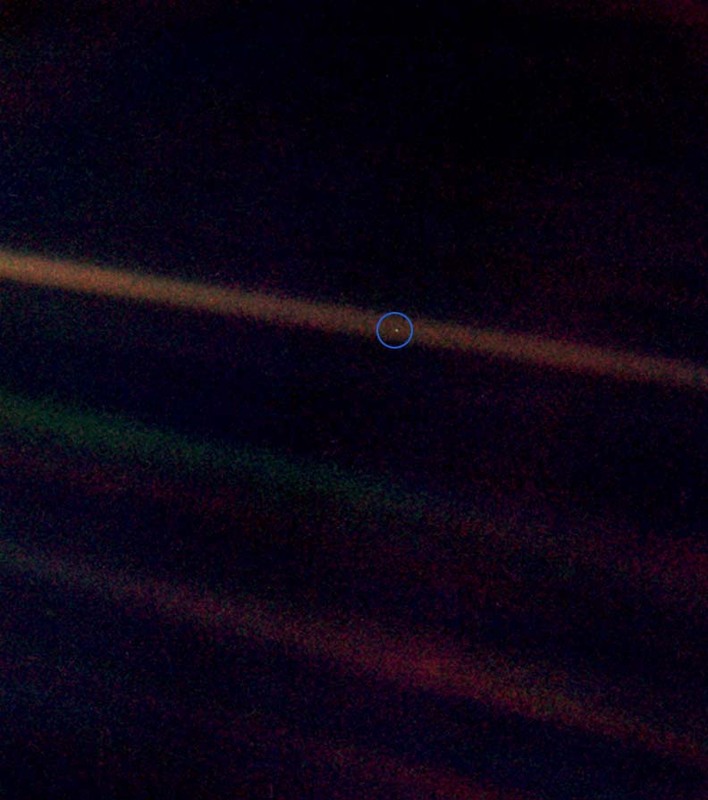 Yes – the circled pixel sized dot in the image on the right – this is Earth. But that dot – that is also a good representation of what you know about security, compared to the whole. Its even more than what I know about security, compared with what there is to know. One thing i have been right about – security, in theory at least, is a fantastic world to be a part of. I left IBM in the late 90s because i had heard about a world that covered all bases in the IT world. And i wasn’t wrong about this. Things did get ugly in the early 2000s – basically IT folk and engineers weren’t welcome any more. This is why we’re in the mess we’re in now. But security, relative to other fields in IT, is still by far the best place to be, at least from where i’m standing. Security is such a vast field, and whichever turn you take, you find another world within a world, and within that world, the more you discover, the more you realise what there is left to discover. So in other words – the more you know about security – the more you know you don’t know. So given all this – does ego and pride have a place in this field? And how do you assess your knowledge compared to others? If you think about it in the context of the image above, if you show excessive ego, hold grudges, or get into regular arguments with others in the field – what this really demonstrates in itself is a lack of awareness of security and how vast it is. Given the vastness of the field, if you’re taking a mocking attitude (99% of the time this will not be communicated to the target of the mockery), i hope you can see now how ludicrous is that attitude? Its diabolical actually. If an Analyst comes from a different background, spent all their time in a certain part of the universe, why on earth (pardon the pun) would you be critical or judgmental of them if they don’t know your neighbourhood as well as you do? Many believe that excessive pride is mainly in the territory of hacking conference speakers, and its here where things get out of control, because of the attention one can get just from doing something as simple as a wifi “evil twin” attack. But no, not based on what i’ve seen. There are security folk from all walks of the sector, and not just the self-proclaimed ‘evangelists’, whose level of self-importance goes as far as taking patronage over the whole sector. From the outside looking in, we in security are viewed in a fairly dim light in many cases. While working in a small consultancy here in the UK, I’ve heard it said while management was assessing a candidate’s suitability for a Consultant role: “is he weird enough?”. Security seniors in that firm regularly used to get in to impassioned exchanges with C-levels, because of the issue as I mentioned of taking patronage over security. Disagreements would spiral out of control. C-levels really just want to have the same understandable conversations, and see the same reporting, from security folk as they do from others. The whole security show does seem like a circus to outsiders, especially to folk in other IT departments. And yet many in this field blame the board (“they’re clueless”) when security is pushed further away from the board, rather than looking at themselves. And as long we do not have a trustworthy means of proving our ability or experience in this field, there will be lots of issues. Many try to compensate for the aforementioned with self-proclaimed titles, and other little nuances. Many develop a whole persona around trying to show the world how great they are. We’re renown for being different, and we are, but we can be more careful about how we show our uniqueness. It should be enough to just keep a lower profile and do our jobs. If we have confidently given our advice, got it in black and white somewhere, that’s all we can do. If after that, others still don’t agree with us, leave it at that. Having an out-of-control ego also prevents us from being team players. We need to be open minded to the idea that others can learn from us and benefit us in return – we will always be stronger as a team rather than as an individual, and no one acting as a lone gun slinger ever helped an organisation to improve its stance in information risk management. Certainly – at least between ourselves, remember how vast a field is security, and don’t lose perspective. As i mentioned above: the more you know about security, the more you know you don’t know. So try not to demonstrate a lack of knowledge by attempting to demonstrate lots of knowledge. Why should i be monitoring for changes in my network(s)? NetDelta allows users to configure groups of IP addresses (by department, subnet, etc) and perform one-off or periodic port scans against the configured group, and have NetDelta send alerts when a change is detected. There’s lot of shiny new stuff out there. APT-buster ™, Silver Bullet ™, etc. Its almost as though someone sits in a room and literally looks for combinations of words that haven’t been used yet and uses this as the driver for a new VC sponsored effort. “Ok ‘threat’ is the most commonly used buzzword currently. Has ‘threat’ been combined with ‘cyber’ and ‘buster’ yet?”, “No”, [hellllooow Benjamin]. The most positive spin we can place on this is that we got so excited about the future while ignoring the present. These new products are seen as serving the modern day needs of information security, as though the old challenges, going back to day 0 in this sector, or “1998”, have been nailed. Well, how about the old stalwart of Vulnerability Management? The products do not “Manage” anything, they produce lists of vulnerability – this is “assessment”, not “management”. And the lists they produce are riddled with noise (false positives), and what’s worse is there’s a much bigger false negatives problem in that the tools do not cover whole swaths of corporate estates. Doesn’t sound like this is an area that is well served by open source or commercial offerings. Why Do I Need To Monitor My Networks For Changes? On the same theme of new products in infosec – how about firewalls (that’s almost as old as it gets)? Well we now have “next-gen” firewalls, but does that mean that old-gen firewalls were phased out, we solved the Network Access Control problem, and then moved on? Neither of these can be good. They can only be bad. And do we have a way to detect such issues currently? How does NetDelta help us solve these problems? Previously unseen host comes online in a subnet, either as an unauthorised addition to the group, or unauthorised (rogue) firewall change or new host deployment (maybe an unsanctioned wifi access point or webcam, for example) – these concerns are becoming more valid in the age of Internet of Things (IoT) where devices are shipped with open telnets and so on. Host goes offline – this could be something of interest from a service availability/DoS point of view, as well as the dreaded ‘unauthorised change’. Change in the available services – e.g. hacker’s exploit is successful and manages to locally open a shell on an unfiltered higher port, or new service turned on outside of change control. NetDelta will alert if services are added or removed on a target host. Host ‘state’ is maintained by NetDelta for as long as the retention period allows, and overall 10 status codes reflect the state of a host over successive periodic scans. The biggest and only major obstacle is the output of ‘noise’ that results from scan timeouts. With some of the earlier tests scans we noticed that sporadic scan time-outs would occur frequently. This presented a problem (its sort of a false positive) in that a delta is alerted on, but really there hasn’t been a change in listening services or hosts. We increased the timeout options with nmap but it didn’t help much and only added masses of time on the scans. The aforementioned issue is one of the issues holding back the nmap ndiff shell script wrapper option, and also ndiff works with XML text files (messy). Shell scripts can work in corporate situations sometimes, but there are problems around the longevity and reliability of the solution. NetDelta is a web-based database (currently MySQL but NoSQL is planned) driven solution with reports and statistics readily available, but the biggest problem with the ndiff option is the scan timeout issues mentioned in the previous paragraph. NetDelta records host “up” and “down” states and allows the user to configure a number for the number of scans before being considered really down. So if the user chooses 3 as an option, if a target host is down for 3 consecutive scans, it is considered actually down, and a delta is flagged. Overall the ‘state’ of a host is recorded in the backend database, and the state is a code that reflects a change in the availability or existence of a host. NetDelta has a total of 10 status codes. Are There Other Ways To Detect NetDeltas? Remember that we’re covering network services here, i.e. the ‘visibility’ of network services, as they appear to hackers and your customers alike. This is not the same as local host configuration. I can run a netstat command locally to get a list of listening services, but this doesn’t tell me how well my firewall(s) protect me. IDS – neither HIDS (host based intrusion detection) nor NIDS (network based intrusion detection) can give a good representation of the view.